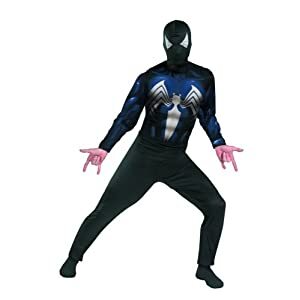 Become a conflicted antihero from the Marvel Universe with a Venom costume for this Halloween. Venom first appeared in 1988 in The Amazing Spider-Man #300. It is a Symbiote, an alien with a liquid-like firm. After merging with Spiderman, Venom was best known for merging with Eddie Brock, where it became an archenemy of Spiderman. SHIELD considers it to be one of the greatest threats to humanity. Yet, despite the potential supervillain status, Venom is expected to be the main character in a 2018 movie with the role played by Tom Hardy. 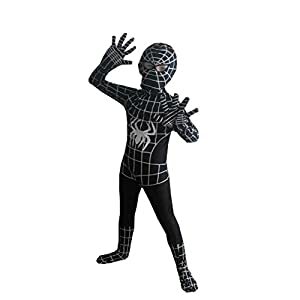 So shop from our selection of Venom costumes now before they are gone. Size Information:S:Length:52.0″, Bust:31.1″, Shoulder:14.2″, Sleeve:22.0″, Waist:31.1″. M:Length:52.4″, Bust:32.7″, Shoulder:14.6″, Sleeve:22.4″, Waist:32.7″. L:Length:52.7″, Bust:34.3″, Shoulder:14.9″, Sleeve:22.7″, Waist:34.3″. XL:Length:53.1″, Bust:35.8″, Shoulder:15.3″, Sleeve:23.1″, Waist:35.8″. If you cannot make sure which size is better for you, feel free to contact us. We would appreciate it if you can give us a chance to help you. Important: Please kindly send us message once you don’t know the sizes.Provide us height,weight,bust,waist and hip sizes.Thank you!. 100% Brand New,Material: Cotton. Including: One-piece garment. Character hood. 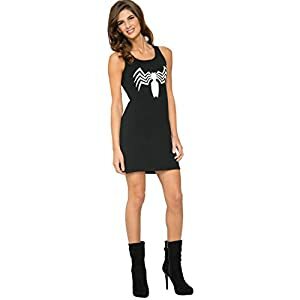 Official marvel licensed costume. Printed tank dress. 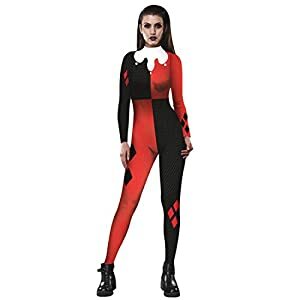 Combine with Venom accessories for a complete costume. Costumes are sized differently than clothing, important to review Rubie’s women’s size chart before making selection.